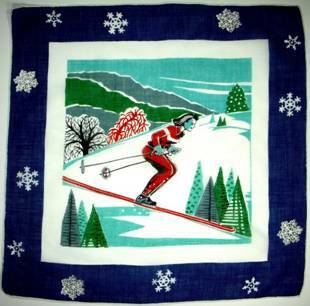 Slaloming, Shredding, Schussing down the slopes … superb, sublime, splendiferous! This sport of champions didn’t always showcase spandex. 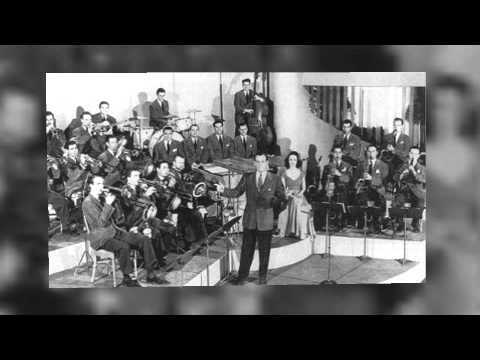 Back in the day, the swells wore hand knit sweaters from Austria, wool knickers, and billed caps. 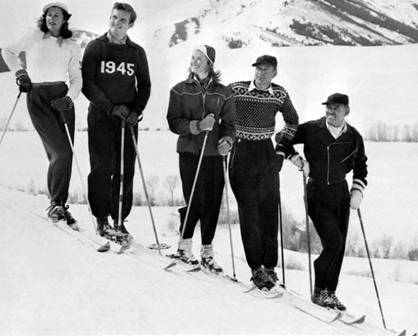 At day’s end, zipping back to the lodge for an après ski toddy, one might spy the likes of (L to R) Mrs. Gary Cooper, Jack Hemingway, (Ernest’s eldest son), Ingrid Bergman, Gary Cooper and Clark Gable. 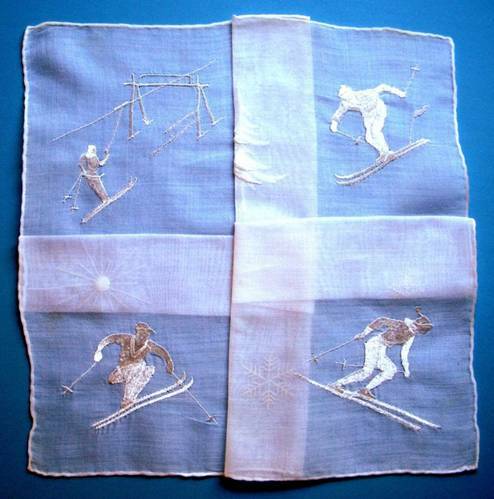 Skiing evokes images of mighty alps frosted with spun sugar snow, pungent pines garlanded with icicle necklaces, crackling fires, cozy quilts, and tummy warming toddies. You can’t help but feel alive in the clean, crisp air, at one with nature. Exhilarated and spent from a day at play, people remain on an emotional high well into the evening. 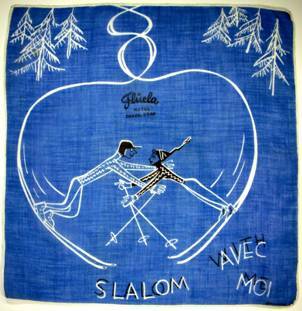 No wonder ski holidays generate thoughts of romance. 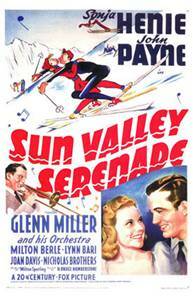 Not surprisingly, fabulous songs like Moonlight Serenade, In the Mood, and At Last grace the Glenn Miller sound track of the 1941 movie Sun Valley Serenade . 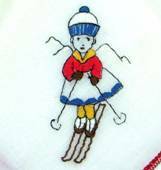 Perhaps during filming some hopeful swain gifted ice skater Sonja Henie with an embroidered hankie like this delightful number. 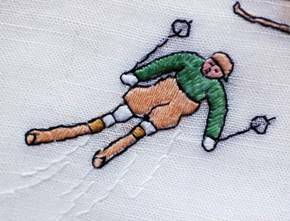 Note the painstaking handwork required to execute these minuscule athletes. 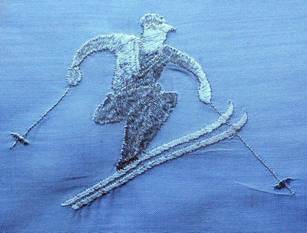 Every stitch on the downhill racer is perfection. Rope tows, T-bars, and J-hooks were the usual way up the mountain, nothing like today’s high powered chairlifts and gondolas. Coincidentally, today’s Sunday New York Times contained an article about who invented the chair lift. According to Daniel Engber, in 1936, Union Pacific railway magnet William Averell Harriman determined there had to be a better way to “lift skiers 2,000 feet above the valley floor.” (He was referring to Sun Valley, Idaho, American’s first ski resort, and the first to adopt chair lifts.) Engineer James Curran, one of the railway’s bridge designers, had at one time invented a wire-based system for moving bales of bananas from the United Fruit loading docks in Honduras onto waiting boats. 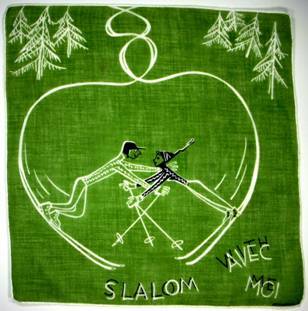 “He thought the same approach would work for people,” says Engber, “if the fruit hooks were replaced with chairs.” Earlier devices either pushed or pulled skiers up the hill; the chair was the first to actually lift people up the hill on cables. So there you have it! I doubt I’ll ever see folks riding a chairlift again without envisioning bunches of bananas. Ay Chiquita! 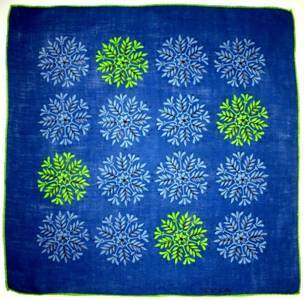 Fans of Handkerchief Heroes know I have a soft spot for children’s hankies and the effort expended to create keepsakes for children. 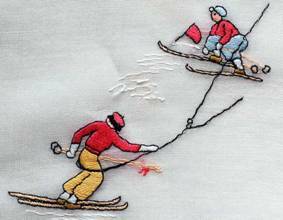 These embroidered examples include the sweetest little girl skiing in matching dirndl and cap, and rambunctious boys on linen as spicy and colorful as their hot dog moves. 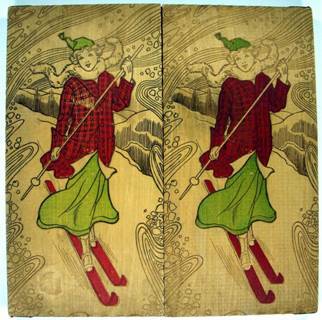 Skiing in a skirt? Indeed. 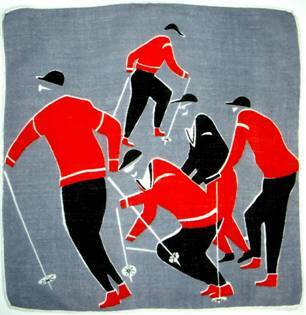 Not until skiing became an Olympic sport in the 1920’s did women adopt pants for their ensembles; before then, it was culottes or skirts. Brrrrr. 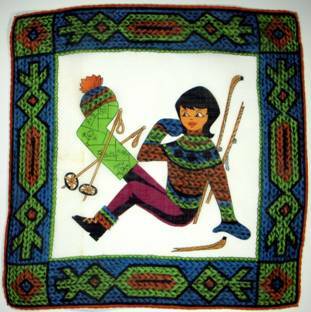 In days past, the upper crust spent time on the slopes for both relaxation and recreation, dressed oh so fashionably. A crisp linen handkerchief was de rigueur to complete the ensemble, and might later be stored in this hand colored, dual door pyrography handkerchief box on the right. What better prelude to romance than falling into each other’s arms? The image of these slaloming sweethearts was adopted by the Fluela Hotel in Switzerland for and advertising piece on the right. 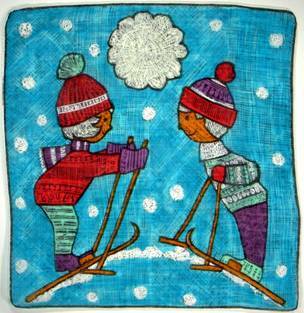 The cool lime and icy blue color palette is repeated by Faith Austin in the sophisticated snowflakes on the left, while Tammis Keefe allows skis and mittens to sunburst center stage, framed by a traditional Scandinavian sweater pattern. I love them both. 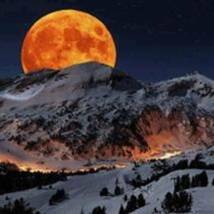 A chance meeting atop a mogul might prompt a return sojourn for your honeymoon! 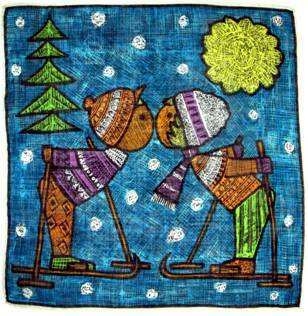 The chill of winter contrasted with the warmth of romance creates enchanting, engaging images. Note the plethora of patterns used on the clothing, yet all blend harmoniously in these adorable portraits. An icy cheeked miss schusses like a pro in her fire engine red ensemble. 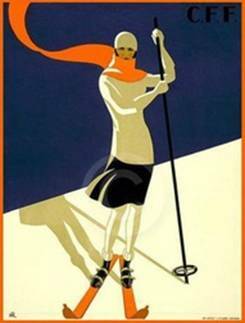 The length of her skis confirms this image is decades old. The stylized trees are up-to-the-minute Madison Avenue hip, while the zing of turquoise adds a final brush stroke of perfection. James Bond couldn’t have worked it better in the sophisticated, minimalist hankie on the right that’s both cool and hot, classic and hip. Not a ski in sight, but the moves are all there for our eye to follow. The punch of tomato and indigo set against the handsome gray backdrop is faultless. 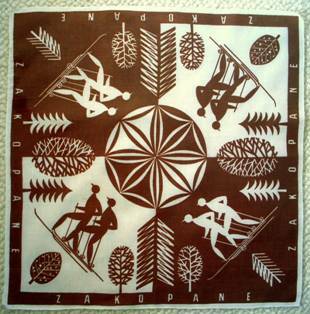 Whether you prefer the modern clean graphics of the cross country travelers from Zakopanke, Poland, or the swirling trails of skiers heading for the old fashioned warming hut on the right, there’s a hankie for every taste. 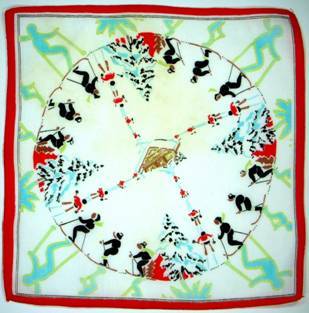 But wait, take a closer look at our red bordered hankie and you’ll find ghostly outlines of icy blue skiers surrounding the perimeter. 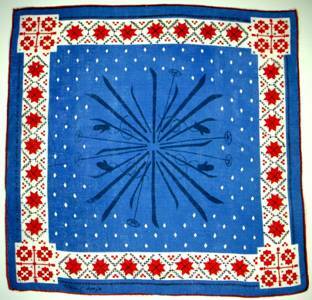 The hankie seems to progress in a timeline from the center outward, from traditional to très moderne. 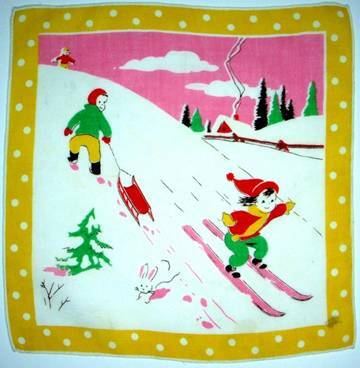 A flurry of polka dot snowballs borders this charming child’s hankie which features children rushing to capture the last minutes of winter daylight, as descending dusk turns the sky rosy pink. 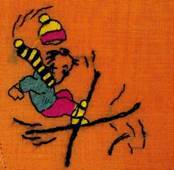 This bold little miss has even ditched her poles – Look Ma, no hands! 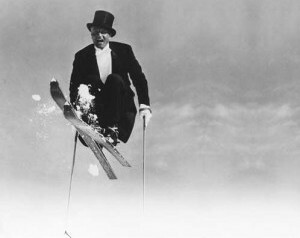 *For the record Odmark was more than a showman on skis. 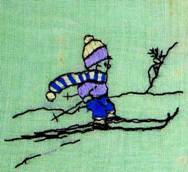 He was a member of the Swedish Nordic and ski-jumping teams. During WWII, he helped the Norwegian underground to subvert the opposition. On skis, at night, carrying a 6.5 mm Swedish Mauser, he managed to avoid enemy ski patrols while transporting communication equipment from Stockholm to Norway, helping the resistance maintain communication with England. Shakin’ the Family Tree. 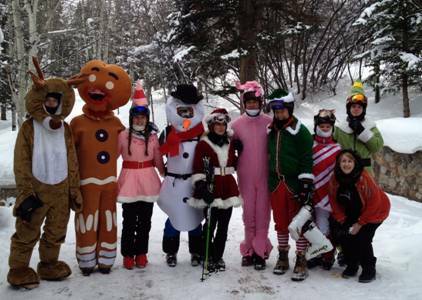 This is how my cousins spent Christmas on the slopes in Snowmass this year, passing out candy canes, mardi gras beads and more. Some people watch all the fun and some people make it happen…. 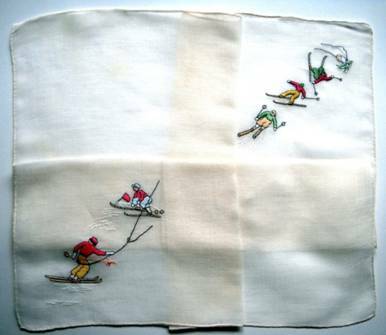 Great blog and AMAZING ski hankies!! !